At Allied Roofing, we have built a reputation for providing premier roofing services to South Florida homeowners and commercial clients since 1984. If youre looking for an experienced and trustworthy roofing contractor in Weston FL, Ft. Lauderdale or other nearby areas, Allied Roofing is the company to call. Our roofers bring unparalleled expertise and professionalism to every job, from basic maintenance to reroofing. Our roofers offer a full spectrum of services, including maintenance, repairs and replacements, for residential and commercial roofs. We work on flat and built-up roofs, and we have extensive experience with most popular roofing materials, including tile, shingles, masonry and metal. You can expect competitive pricing on all of our services, since we are always looking for opportunities to keep your costs lower. We will always go the extra mile for our clients. When you hire us for roof repair in Weston FL, Miami or Coral Springs, we take time to identify the ideal option for your situation. If you are dealing with storm damage, we can collaborate with your insurance company throughout the repair process. Any time that you want lasting results and a less stressful roofing experience, we are the company to turn to. We know that it can seem difficult to find the right roofing company in Coral Gables FL, Palmetto Bay or other nearby areas. However, we promise excellent service from the moment that you contact us, along with unbeatable final results. To learn more about our services or get an estimate on an upcoming project, use our convenient online request form or call us directly at (855) 729-6096. 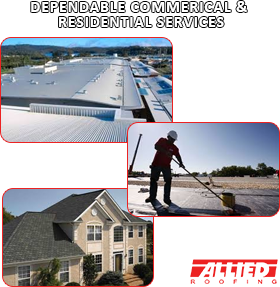 Allied Roofing Features and Installs Roofing Products from these Well-Known Manufactures.